Write on Ink Publishing, 9780991654413, 324pp. -Learn to talk so your doctor will listen. -Understand every diagnosis-and realize that you can survive bad news. -Follow Dr. Ed's 8 simple commandments for living well-and you'll live long enough to cash in your 401(k). -Separate hype from hope, especially with perplexing medical headlines and confusing Internet information. -Get insight into what your doctor wasn't taught in medical school. -Combine the best of traditional and complementary treatments. Dr. Edward Creagan has been treating very sick patients for more than 35 years. 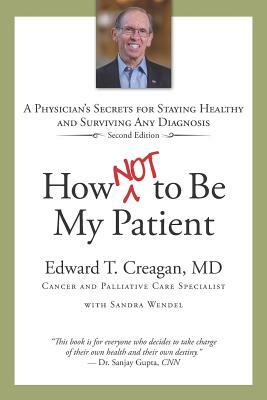 This book is not just about lifestyle choices, although these are important aspects of Dr. Creagan's healthy living plan. It is about using your precious minutes in the exam room (the average doctor visit is about 16 minutes), forging the right kind of relationship with your care providers (because that world is changing quickly), and understanding and using the health care system-instead of having the system use (and often abuse) you. Edward T. Creagan, MD, is a professor of medical oncology at one of the world's leading medical centers. He is board certified in internal medicine, medical oncology, and hospice medicine and palliative care. "Dr. Ed" is the author of over 400 scientific papers and has made more than 1,000 presentations throughout the world on health, hope, burnout, and the healing power of pets.